Earn Extra Money Selling Unwanted Clothes - Clean Out and Cash In! 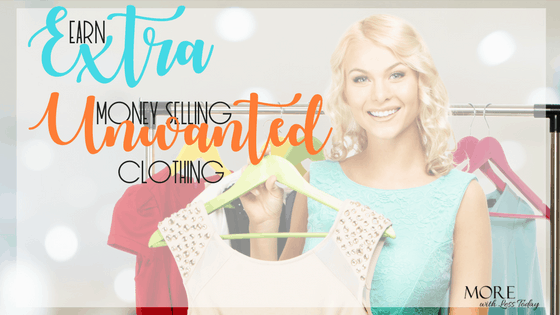 Earn Extra Money Selling Unwanted Clothes – Clean Out and Cash In! Earn extra money selling unwanted clothes with Tradesy. It’s a great way to pare down and make a few bucks too! This site was previously featured on The Today Show with KLG and Hoda. According to Jill Martin, a consultant for The Today Show, Tradesy charges the lowest commission of any other online retailer. The seller, you, will pocket 91% of the selling price. Another bonus – there is no cost to list your items, free returns for the buyer and free shipping for the seller. “Tradesy is a buy-and-sell marketplace for fashion, built by and for women. Millions of stylish members use Tradesy to sell straight from their closets and to save up to 90% on pre-owned bags, shoes, clothing, and more, from top designers. Tradesy makes it easy sell online. List items for sale in under 60 seconds, set your own price, and let us handle shipping and returns. Sell anything from Lululemon to Chanel, as long as it’s in great condition. Discover millions of pre-owned designer fashion items at up to 90% off. Return any item for any reason and get Tradesy Site Credit. Explore the site and this link will give you a $20 credit on your first purchase of $50 or more. Clean out your closet and turn trash into cash. If you are a thrift store digger like me, you may want to turn some of your big designer scores into a nice paycheck! In the coming days, we will be sharing more ways to find extra money. It’s a great way to start or increase a rainy day fund. Do you have ideas to share for our series, turn Trash into Cash? We would love to hear them. Hop over and post to our Facebook page!